At Adapted Vehicle Hire our extensive range of adapted cars and Wheelchair Accessible vehicles for the disabled is growing! We have added to our fleet of Adapted Cars the Honda CRV automatic, providing a quality comfortable ride combined with the space and adaptations to make this a superior adapted car. 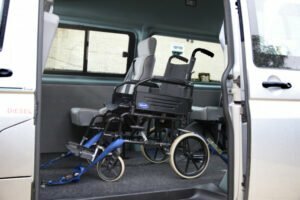 Get a quote to hire our new adapted and wheelchair accessible vehicles. To book one of our vehicles just call our friendly team on 0845 257 1670 who will ensure an accessible vehicle or adapted car is provided to meet your specific needs.